Woodlawn Cemetery is a massive necropolis, four hundred immaculately and privately maintained acres in the north Bronx that serve as the final resting place for three hundred thousand New Yorkers. It is a place of startling serenity and architectural distinction as well as cultural and historical significance that nonetheless remains unknown to the majority of people who live in the city. Which is surprising when one learns that its (very) long-term inhabitants include Herman Melville, Duke Ellington, Robert Moses, Fiorello La Guardia, Miles Davis, and dozens of Gilded Age grandees—including Goulds and Astors—who were determined to spend eternity with opulence to match their residences while alive. Writer Fred Goodman stumbled upon Woodlawn one day when he wandered off his bicycling path. 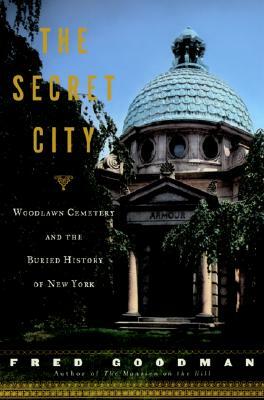 The Secret City is the product of his frankly obsessive researches into the lives of many of the once famed, now forgotten men and women buried there. Featuring nine dramatic episodes, chronologically arranged, each story presents an exceptional individual caught up in a defining or historical moment of New York’s social, political, commercial, or artistic life. Readers meet phrenologist and publisher Orson Fowler, ASPCA founder Henry Bergh, Gilded Age railroad magnate Austin Corbin, political satirist Finley Peter Dunne, “Boy Mayor” John Purroy Mitchel, attorney Francis Garvan, sculptor Attilio Piccirilli, Harlem Renaissance poet Countee Cullen, leftist East Harlem Congressman Vito Marcantonio, and pioneering aviatrix Ruth Nichols. Framing and tying together these novelistic tales is the first-person narrative of the author’s discovery of Woodlawn and his research. The Secret City is, then, an act of resurrection—a way of putting flesh on the anonymous dead, and humanizing and demystifying a city whose fabulous history is, too often, interred with its inhabitants.